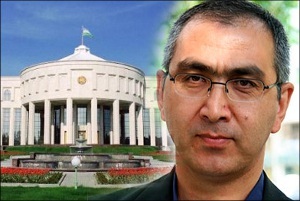 Pulat Ahunov is an oppositionist from Uzbekistan, who is chairman of the Sweden-based Association Central Asia and the founder of the Foundation for Combatting Corruption in Uzbekistan. Mr. Ahunov shares his memories of meetings with Islam Karimov in late 1980s to mid-1990s. Having finished our meals, we resumed the trip… The feeling of freedom and a delicious meal overwhelmed me, so I started drowsing. Memories started cycling through my mind as images in old films only occasionally disturbed by The Master’s words. Starting in March 1989, I attended many meetings and sessions as a People’s Representative of the USSR, where representatives of highest echelons of power in Uzbekistan, [the Uzbek Communist] party’s regional secretaries, members of the [Uzbek Communist Party] Central Committee, parliamentarians and others participated. Obviously, Islam Karimov was among them. It must be said that this person had nothing exceptional compared to his colleagues. But there are a few memories about this man coming to mind, nonetheless. Of such is an event of June 1989, which has changed my life forever and led me to the path that I am on to date. During a session of the People’s Representatives of the USSR on 2 June 1989, I violated the standing orders by coming up to the tribune and stating that the floor was not given to those Uzbek MPs who have differing views on the status quo in the Uzbek Soviet Socialist Republic that differed from the colourful reports of the republic’s leadership. “Why are we not allowed to speak about the catastrophic state of affairs in the republic?” was the red line in my speech. It is difficult to describe the feelings that overwhelmed me then. I was only 27 years old and was speaking at the pulpit of the Kremlin Palace of Congresses. Meanwhile, over 2 000 People’s Representatives of the USSR were watchfully listening to me on the one hand, while Mikhail Gorbachev and other leaders of one of the global superpowers were watching me on the other. After the session, Rafiq Nishanov, the first secretary of the central committee of the Communist Party of Uzbekistan, told all representatives of Uzbekistan to gather in the hall, including Islam Karimov, who then was the first secretary of the Kashkadarya regional committee of the Communist Party. First Secretary Nishanov started screaming at me in front of all others: “Do you even understand what you have done?! What you have put on your own life!” Nishanov continued expressing his indignation theatrically and grandiloquently: “Who has given you the right to say such a thing? !” Despite these words, one could clearly see this normally friendly man was not keen to make the air blue or humiliate his colleagues and subordinates. I was taller than him so I literally looked down on him and calmly said, “I am a [people’s] representative; my voters are behind me and they gave me this right. And you may not dare to scream at me, because you and I are bestowed equal rights and powers here.” First Secretary Nishanov, obviously, thought of my behaviour as of an unprecedented audacity. However, Rafiq Nishanovich had a specific inner intelligence, so he realized he was wrong at the moment and the situation was hurting his position; he suddenly withdrew his attacks on me. Vytaustas Landsbergis, a representative from Lithuania, who then was the leader of the Sayudis Opposition Movement and later voter Speaker of Seimas, became an involuntary witness of this squabble. He came up to me after my colleagues’ failed attempt to bash me and said with a soft Lithuanian accent, “It is not easy being a democrat in Uzbekistan…” He then threw an ironic glance at the Uzbek representatives petrified from surprise and continued, “I don't understand why they keep sending me those telegrams from Uzbekistan all the while you are there?” He, too, handed me a pile of telegrams from my country, in which Uzbek nationals expressed indignation with their representatives for unquestionably joining the ranks of “aggressively submissive majority.” I still keep all those telegrams. That said, we still maintain friendly relations with Mr Landsbergis, who is an elected Europarliament member. We often exchange opinions on current global politics and discuss socio-political processes in the formerly Soviet countries. This story took an absolutely unexpected turn that same night. Secretly from each other, all of the first secretaries of regional committees in the Uzbek SSR visited me at my hotel room to say that they were throwing their support behind me in the conflict with Nishanov. Among them was our hero, Islam Karimov, whom I was seeing for the first time then. He, too, came to my hotel room and said some to the effect of “you did a great job; hang in there; be not afraid of and bravely criticise him; we all support your position,” etc. It appears that everyone who came in contact with Islam Karimov’s work style and methods could clearly see blemishes in his nature. For instance, during a session of the Supreme Council of the Uzbek SSR in April 1990, Representative Shavrukh Ruzimurodov from Kashkadarya Region wanted to speak against nominating Islam Karimov for presidency, but he was not given the floor. So he just took to the centre of the session hall and screamed, “Do not vote for this man! He is a horrible person! You will regret and repent bitterly!” Everyone was looking at him as if he was an insane person. Representative Ruzimurodov was later stripped from his mandate, thrown in jail but the public’s pressure forced the authorities to release him in 1991. I travelled to Karshi several times back then and organised rallies against his imprisonment, and the authorities forcibly removed me from the region every single time. Representative Ruzimurodov was released only because Karimov has not reached absolute might and unquestioned authority yet. But the release did not mean pardon. This courageous man was not left unpunished for his “crime”: Mr Ruzimurodov was killed in the internal affairs ministry’s building [in Tashkent] in July 2001. May he rest in peace and may his executioners be cursed! During one of the sessions Islam Karimov chaired as First Secretary of the Central Committee, I asked him several questions that have stirred an uncovered irritation. Salijan Mamarasulov, then First Secretary of Tashkent Regional committee of the Communist Party, approached me after the session. He was one of the most influential first regional secretaries in the country; he enjoyed respect in Moscow and personally from Mikhail Gorbachev. President Gorbachev paid personal attention to him and would talk to him privately from others. I was acquainted with Mamarasulov since 1979, when I spoke in his presence with criticism of rather miserable working and living conditions students found themselves during cotton-picking campaigns. Mamarasulov was then First Secretary of the Andijan Regional committee, while I was a 17-year-old student. Salijan Mamarasulov comes up to me after the session and said, “Pulat, run while you still have time. He is a very horrible person; he will not leave you alone, or your oppositionist friends or us who know him. Yes, we are now doomed too.” At the time of that conversation, I thought to myself that Mamarasulov was only trying to save myself from my thoughtless audacity so I would stop making the leadership angry; but he was absolutely serious. Karimov used the first chance to sack Mamarasulov and forced him into retirement. Islam Karimov was appointed first secretary of the Communist Party of the Uzbek SSR in 1989. He probably imagined his job just as his predecessors Nishanov, Usmankhojayev, Rashidov, Yusupov and Ikramov did. That is, Moscow tasks him with oversight of the status quo in Uzbekistan and he reports to the Centre on his acts. Even when many were already talking about independence, Islam Karimov argued against the idea, claiming independence would be the country’s doom. I remember him saying that our country does not have access to sea and would wind-up in a “stone sack.” He also said, “If we become independent, embassies would have to be opened in many countries… Where are we going to get money for that?” Reading newspapers of the time would suffice to learn Karimov’s position in regards to sovereignty. That said, he led preparations and administration of a referendum for preserving the USSR. However, the USSR did implode and seized to exist. The party boss was unexpectedly hit with state independence in his head and he now had to engage in the establishment of an independent state against his will. Naturally, first several years in the life of the young nation were the most challenging ones, because there were hundreds of fields to get actively engaged in. The primary task was putting together a team and involving those who would acknowledge him as their leader, be loyal to him and not betray him in critical situations. Islam Karimov had a quite big number of opponents in early 1990s, because the spirit of perestroika and glasnost were still present in society. On top of that, legal political was conceived in the country, which initiated political battles in the parliament and regions. Karimov was on the verge of removal from office several times. For instance, the Supreme Council discussed dismissing the president in the autumn of 1991; the people’s representatives were authorized to remove him from office by simple voting. But the future usurper withstood, having mobilized all of his resources and his talent to weave administrative games and intrigues. He made a very important conclusion after that event: the parliament’s independence may put an end to his career as head of state. Ever since, Karimov pays a special attention to the parliament’s structure and members to ensure it is unable to play a political role independently. Karimov’s desire is to bar personalities capable of resisting him or even conspiring against his single-handed authority from becoming members of parliament. He would not have been able to become such an authoritarian dictator in the Soviet political system. Truth be told, he could not become who he is in independent Uzbekistan if the separation of powers were established in the very beginning, the opposition were allowed to gain force, independent mass media outlets were allowed to work. He would have stepped down after his constitutional term expired, and we would see a different scenario of development in Uzbekistan. If the Uzbek intelligentsia elite did not succumb in front of then still weak authorities, and instead openly discussed its decisions and correct the newly minted president’s and other leaders’ actions, we would not be in such disgrace. Karimov could see that well-known elite were ready to pour buckets of dirt and humiliate one another only for the sake of looking good in his eye, hearing a word of praise from him, and a high-ranking position which would grant them the right to issue orders that change people’s lives. He saw them through and started simply buying out former opponents. Those known for their opposition-leaning attitudes started lowering their voices against him and later withdrew from doing so altogether. They soon left the ranks of the opposition and resurfaced in high-ranking offices in various institutions. 1. The declaration of human rights and liberties. 2. The establishment of a new system of interaction among the Soviet Union’s member-states, and the announcement of a transition period for preparing a new Union Agreement. 3. A document on branches of power and governance during the transition period. This document essentially cancelled the Sessions of People’s Representatives. It was decided to establish a new legislative body, instead of the dismissal of the Session of the People’s Representatives of the USSR, to be called the Supreme Council of the USSR, which would be comprised of representatives elected in the republics of the Soviet Union. The essence of this particular decision was having the Supreme Council of Uzbekistan to elect representatives to the Supreme Council of the USSR and send them to Moscow with the right to defend the interests of Uzbekistan and participate in the process of drafting a new Soviet Union Agreement. The Supreme Council of Uzbekistan held a session in Tashkent in September 1991, which was broadcast on [Uzbekistan-wide] TV channels, so many saw what was unfolding during the session. If my memory is serving me well, respected Nasrulloh Said, Jakhongir Muhammad and other colleagues were present at that session, so I hope they will correct me if I make any mistakes in narrating what happened there, or fail to mention something. It would be far-fetched to say the session saw heated debates or discussions, because all of the people to represent Uzbekistan in Moscow were already selected and approved by the president’s administration. Renowned writer Pirimkul Kodirov read his report on the selection and approval of plenipotentiary representatives. He then announced a list of candidates had already been drafted and read the names in it. Kodirov then proposed to approve of the list without further discussions. Pirimkul Kodirov had glanced back with a content face in order to receive The Master’s approval. However, Karimov shocked everyone: “Comrades, to my mind, the issue of [the candidacy of] Pulat Ahunov should be considered. It would be good if we include him into the list of plenipotentiary representatives of our country. This person is someone our country needs.” Upon hearing these words, Pirimkul Kodirov had instantly changed his attitude towards the issue at hand and started screaming in front of thousands of people (including those watching TV), “Look! Look! The president is showing generosity! Our President Islam Karimov has said absolutely correct words! [He] made a very good and correct proposal. Of course our president is on the right track: it will be better if our enemy remains amongst us, not outside.” So my name was included into the list and unanimously approved. Thus, upon the nomination by President Islam Karimov, I was elected a plenipotentiary representative of the Republic of Uzbekistan in the Supreme Council of the USSR. Religion started filling the void left in the aftermath of an implosion that crushed the Soviet Union. Uzbekistan was no exclusion: People obtained the right to practice the religion of their forefathers without any limits, to build mosques, and to travel to Islamic countries and fulfil pilgrimage rites. Islam Karimov attempted to utilise this new factor in the society’s life for his own political benefit—he tried to show everyone that the Islamic revival was taking place in Uzbekistan thanks to him alone. He saw no threat to the foundations of the state, presuming he could control the process. His delusion stemmed from numerous sincere thanks the country’s residents expressed for legalizing religious beliefs and practices. But several events in Namangan in 1991-92 crushed those illusions and have clearly manifested what a dangerous force Islamic radicalism is. Namangan Region turned into a stronghold of Islamists and was de-facto under the control of numerous organisations they spawned. The most known and ominous among those was Adolat, whose backbone was composed of radical clerics, former paratroopers and veterans of the Afghan war. Back then in December 1991, they captured the building of a regional state administration under the leadership of the notorious Takhir Yuldashev in response to awkward actions the local government undertook by ignoring the activists’ demands to arrange a meeting with Karimov. The president was in the region the day before as part of his pre-election campaign and had already left for Tashkent… Allow me to remind that the first general presidential elections were scheduled in that year, and the sitting president—Karimov—was a presidential hopeful at the same time. So, Karimov had to immediately return to Namangan. He refused to have security details, having confidently stated that it was useless in that situation. Islam Karimov and Ismail Jurabekov deserve credit for their courage in that situation in Namangan: they did not fear to meet an outraged crowd, which was ready to tear them into pieces at any given moment, should they say a wrong word or do a wrong gesture. In essence, they were taken hostage, and our hero displayed impressive qualities of a negotiator in order to leave the situation safe and sound. The extremists were able to eke out of him a promise that attributes of an Islamic society would be introduced in Uzbekistan, although they were demanding the Shariah. That is perhaps when Karimov realized that an uncontrolled development of religiosity in society and flirtations with Islam could lead to catastrophic consequences. Most probably, he made the following decision right there and then—sitting there kneeling down in front of that fanatical group and the half-educated youngster Tahir Yuldashev: it is necessary to undertake harsh measures in order to rein in the threat of “crawling expansion” of religious extremism; otherwise radical groups’ influence would swiftly expand onto the entire country. Such a trend would jeopardize his power and the existence of a new state, which Karimov started building in accordance with his own imagination and vision. Everything in the new state was built and established according to Islam Karimov’s design. At least that is what he thinks. The state symbols, a new governance apparatus, the army, security and law-enforcement bodies, courts, legislature and everything else is under the watchful eye of Papa, as he is known among the bureaucrats and officials. Clearly, the feelings of being a builder of a new home and a founding father boost his self-esteem and pave way for thoughts of “ownership” over the country; after all, he is “an outstanding historical personality.” There are very few who ponder over the fact that these “reorganisations” were stitched together using Soviet “material” under the slogans “borrowed” from [the now opposition] Birlik and Erk parties. Official documents and history books talk about only one person—Islam Karimov, who has created everything! Nobody else is mentioned. He did, indeed, worked on all this surrounded by nomenclature and opposition, who he thought were his enemies burning with desire to throw him off the much-desire throne and occupy it. Everyone was an enemy in his eyes: the controlling and demanding Moscow coupled with the local party nomenclature that thought he was only a lucky arriviste and dreamt of throwing him out using behind-the-curtain intrigues. He was especially disgruntled by the presence of Moscow’s “commissars”; he particularly hated Second Secretary Yefimov and used every single chance to demonstrate his disdain and independence. He also thought of the Birlik and Erk opposition organisations as of his enemies, because they openly spoke out against him and demanded democratic transformations; they saw a threat to his own grip on power in them. He saw enemies in everyone throughout his entire life so he can fight and destroy them. I don't think Karimov was initially planning to rule the country utilising repressive methods, jailing people, killing or exiling Uzbek citizens. However, as misdeeds piled up and criticism increased, he thought there were forces impeding him from achieving targeted goals, and he believed he had the right to eliminate those by any means necessary. We, the Uzbek nationals, must get rid of the major illusion, i.e. our belief in the just ruler. This is the biggest mistake our nation and the majority of intelligentsia committed. One may not believe in the existence of a just ruler; instead, the system of checks and balances must be introduced. The principles of establishing and functioning of the governance system must be just and fair, in order to enable both good and bad leadership to follow the same rules. Only then it could be guaranteed that they would not trespass their boundaries. Pulat Ahunov, March 2015. This essay was written exclusively for Fergana.